"The Center for International Collaboration and Advanced Studies in Primatology (CICASP) promotes internationalization at Kyoto University's Primate Research Institute (PRI) through its research and educational activities. CICASP is dedicated to the recruitment of international students, the facilitation and support of international collaborations, and the education and encouragement of students to become leaders in their respective international scientific communities." 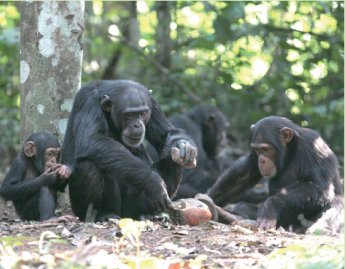 Photo: Chimpanzee lithic technology in Guinea.